Piezoelectric materials are commonly used in optoelectronic industries in fabricating sensor, capacitor, and actuator owing to their piezoelectricity and wide range of dielectric constant. In these materials a strong relationship exists between mechanical displacements and electric field i.e. it induce electric polarization in response to applied stress and strained in response to applied electric fields. The perovskite structure, ABO3 type material usually exhibits spontaneous polarizations in response to mechanical stress . Additionally, this perovskite structure is promising in positive coefficient (PCT) resistors, light-emission devices, and field emission displays (FEDs) . The perovskite, barium titanate (BaTiO3) has recently gain significant attention due to its demand for lead-free piezoelectric materials in several industries. In addition to that, the perovskite structure of BaTiO3 attracted significant attention due to its exceptional dielectric, piezoelectric, and electro optic properties . These exceptional properties make it a promising material for other applications such as multilayer ceramic capacitors (MLCCs), dynamic random access ferroelectric memories (DRAMs) . This material requires non-centrosymmetric crystal structure to behave as piezoelectric, because its centrosymmetric cubic crystal structure doesn’t show piezoelectricity, whereas hexagonal, tetragonal, orthorhombic, and rhombohedral shows due to their non-centrosymmetric structure . In BaTiO3 the piezoelectricity is highly depends upon its crystal structure, lattice vibration, and grain size etc. Furthermore, in order to alter its piezoelectric and ferroelectric properties, many researchers have used various doping methods to modify the dielectric and piezoelectric properties [5,6]. Recently, it was reported that distortion in perovskite BatiO3 reduced symmetry, which enhanced its magnetic and electrical properties . Moreover, Chernova et al. demonstrated that strain induced in BaTiO3 unit cell enhanced its ferroelectric polarizations . Thus, after considering the vast importance of BatiO3 and its crystal structure in several applications, authors wish to investigate an approach that could be beneficial to modify the atomic and structural properties of BatiO3 powder. William Tiller, a physicist, reported that the existence of a new force related to human body, in addition to four well known fundamental forces of physics such as gravitational force, strong force, weak force, and electromagnetic force . Biophysicist Fritz-Albert Popp et al. reported that human physiology shows a high degree of order and stability due to their coherent dynamic states [10-13]. This coherent dynamic state of human body emits the electromagnetic waves in form of bio-photons, which surrounds the body and it is known as biofield. Therefore, the biofield consisting of electromagnetic field, generated by moving electrically charged particles (ions, cell, molecule etc.) inside the human body. Furthermore, a human has ability to harness the energy from environment/universe and can transmit into any object (living or non-living) around the Globe. The object(s) always receive the energy and responded into useful way that is called biofield energy. This process is termed as biofield treatment. Mr. Trivedi’s unique biofield treatment is known as The Trivedi effect®. Mr. Trivedi’s biofield treatment is known to alter the crystal structure and atomic level changes in various ceramics and metals [14-21]. Additionally, the biofield treatment has also transformed the molecular and cellular properties in agriculture [22-24], microbiology [25-27] and biotechnology [28,29]. Recently, it was reported that biofield treatment had increased the particle size by six fold and enhanced the crystallite size by two fold in zinc powder . In another report, biofield treatment has shown the significant effect in carbon allotropes, where the unit cell volume was decrease by 1% and crystallite size was increased by 100% . To the best of our knowledge, this is the first report to evaluate the impact of biofield treatment on atomic and structural characteristics of BaTiO3 powder. BaTiO3 powder was procured from the Sigma-Aldrich (MA, USA). The powder sample was divided into two equal groups i.e. control and treatment. The control group was remained as untreated and treatment group was subjected to biofield treatment. The treatment group was handed over in sealed pack to Mr. Trivedi for biofield treatment under standard laboratory condition. Mr. Trivedi provided this treatment through his energy transmission process to the treatment group without touching the samples. After that, both control and treated samples were characterized using X-ray diffraction (XRD), Fourier-transform infrared spectrometer (FT-IR) and Electron spin resonance (ESR). Here, ΔV=(Vt-Vc)/Vc where Vt and Vc are the unit cell volume of treated and control samples, respectively. The percent change in all other parameters such as density, molecular weight, and lattice parameter were calculated in the similar way. 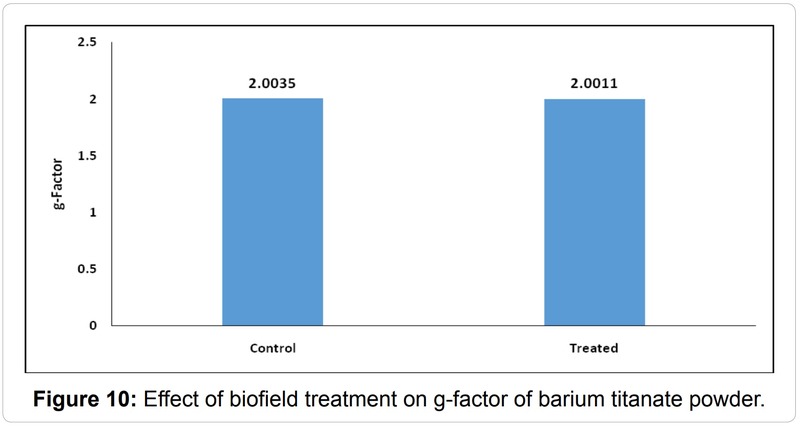 Both, control and treated BaTiO3 were characterized using Shimadzu, Fourier transform infrared (FT-IR) spectrometer with frequency range of 300-4000/cm. 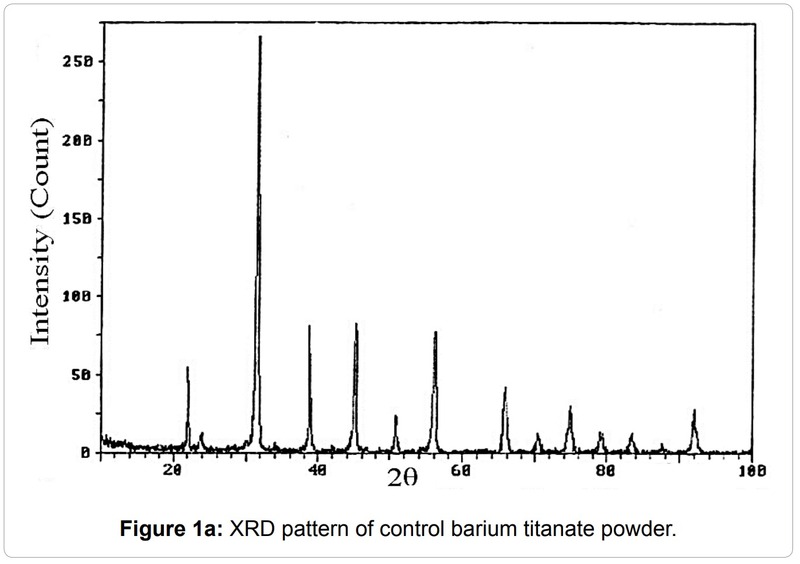 ESR analysis of control and treated BaTiO3 samples were carried out on E-112 ESR spectrometer of Varian USA of X-band microwave frequency (9.5 GHz), which had sensitivity of 5 × 1010, ΔH spins was used to analyze the electron spin properties. 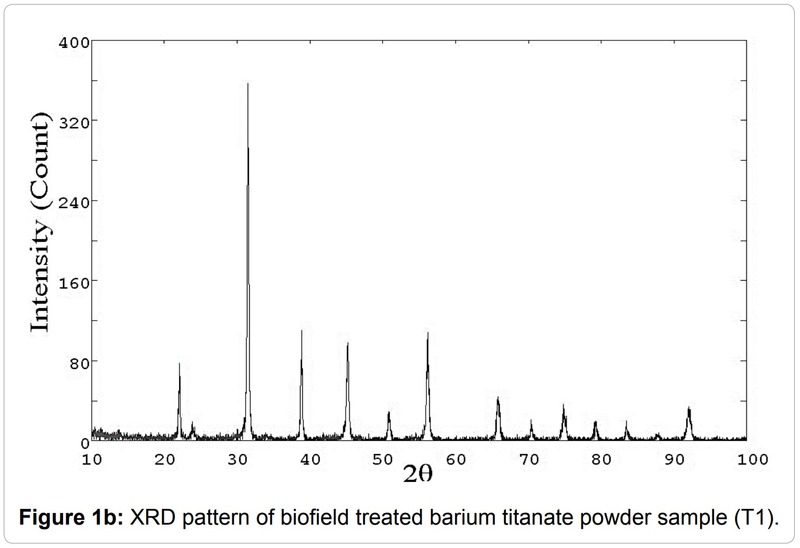 Table 1: X-ray diffraction analysis result of barium titanate powder. to its original shape and become unstrained . On the contrary, in this experiment the lattice strain was permanent, i.e. the unit cell was permanently distorted after biofield treatment. Thus, it is postulated that biofield treatment acting at atomic level to induce this permanent strain in BaTiO3. Additionally, it was also observed that the molecular weight was reduced upto 1.36% after the treatment, which indicates that the biofield treatment possibly acting at nuclear level to cause these changes. Furthermore, Y. Tanaka et al. demonstrated that compressive strain in BaTiO3 increased the remnant polarization and reduced the dielectric permittivity that enhanced the piezoelectric coefficient . In addition to that, this compressive strain found in treated BaTiO3 may lead to reduce the symmetry of the crystal structure. The reduction in symmetry probably enhanced the piezoelectric properties in treated BaTiO3 as compared to control [8,9]. Table 2: FT-IR Strecthing and bending vibration frequency of Ti-O bond in barium titanate powder. Where, MTi=Atomic mass of titanium (Kg), MO=Atomic mass of oxygen (Kg), ν=IR wavenumber (/cm). was increased in treated (1.979Å) as compared to control (1.965Å). 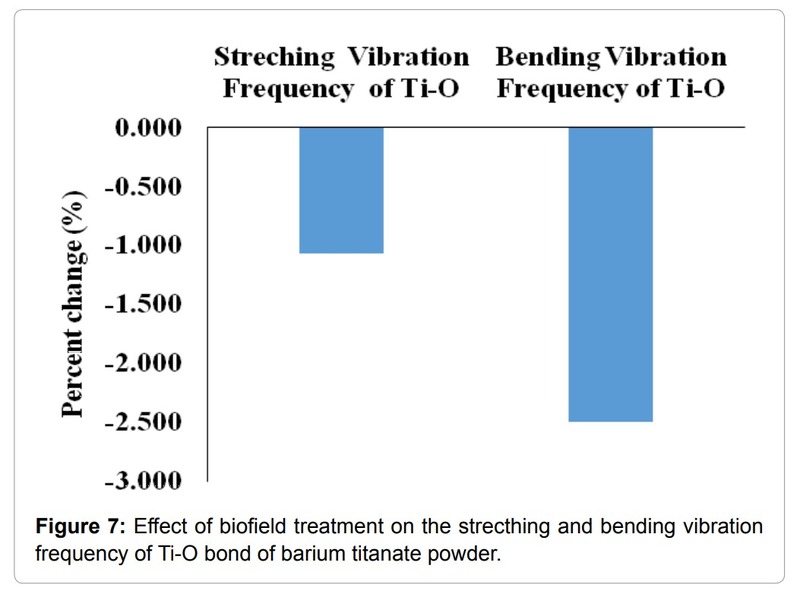 This indicates that the Ti-O bond length was increased by 0.72% after biofield treatment (Figure 9). Additionally, the shifting of bending vibrational frequency from 441/cm (control) to 430/cm (treated) might be due to distortion of BaTiO3 unit cell after biofield treatment . These findings suggest that biofield treatment has significantly altered the bond properties and vibrations of crystal lattice possibly through the electric and magnetic fields. Sun et al. demonstrated that the vibrations of crystal lattice of BaTiO3 had significant effect on its Ferro-electricity and piezoelectricity . The ESR spectroscopic data are presented in Figure 10 and 11.The g-factors computed from ESR spectra were 2.0035 and 2.0011 for control and treated BaTiO3, respectively (Figure 10). The signal for g-factor at 2.00035 and 2.0011 were probably originated due to titanium vacancy with unpaired electron spin . It was also observed that ESR signal height was reduced by 85.71%; and width was increased by 300% as compared to control (Figure 11). 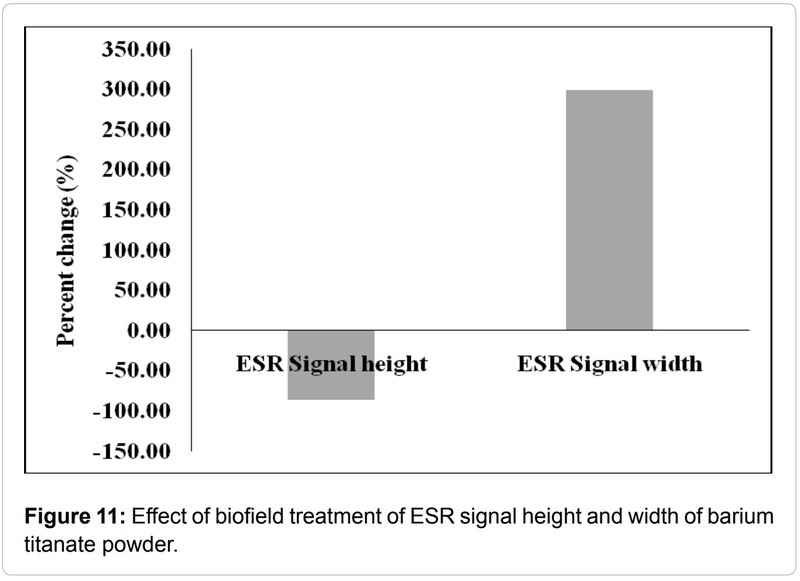 The decrease in intensity and broadening of ESR signal implies that the particle size probably reduced after treatment . 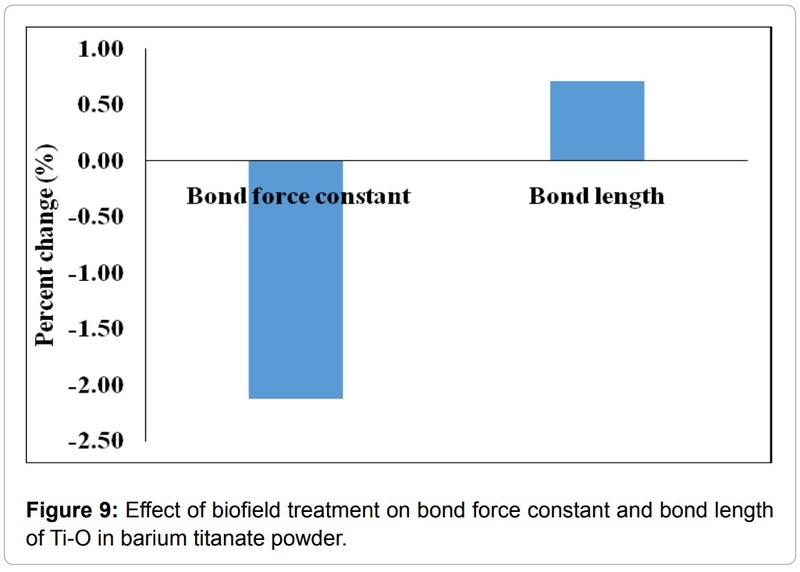 It is postulated that during biofield treatment, the energy has been transferred to BaTiO3 powder sample in form of electric and magnetic field, which may induced high energy milling and resulted into smaller particle size. 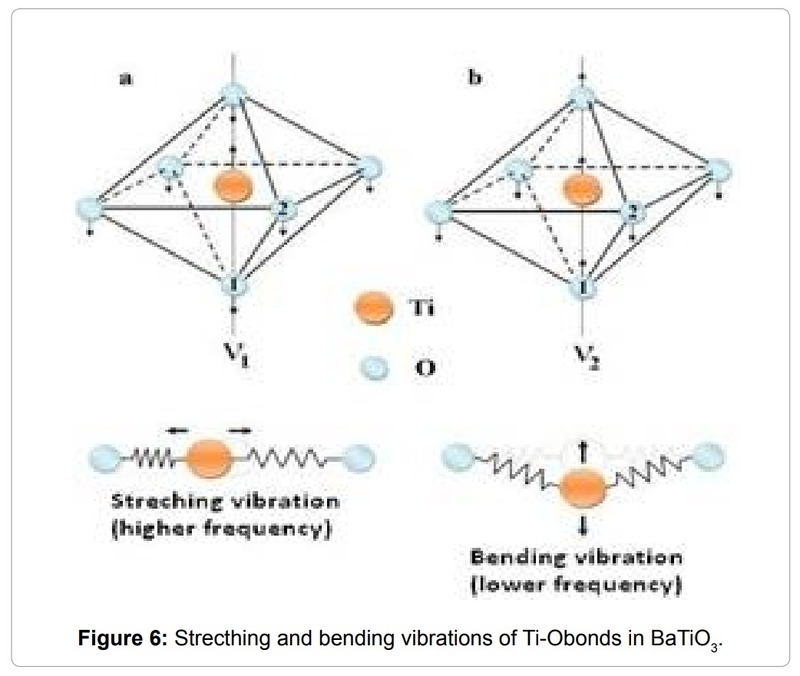 In summary, the biofield treatment has induced the permanent compressive lattice strain in tetragonal crystal structure of BaTiO3, which may occur due to electromagnetic field transferred through biofield treatment. This permanently strained crystal structure of BaTiO3 led to alter its piezoelectric behavior. 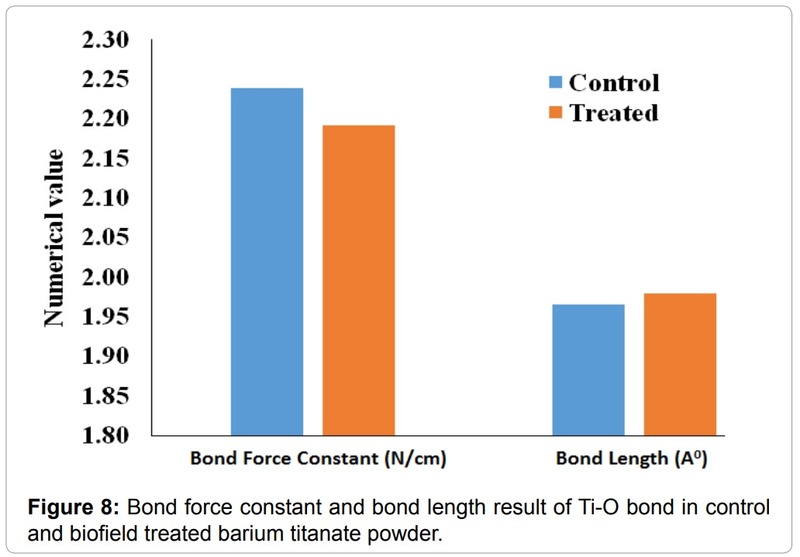 The FT-IR analysis result revealed that Ti-O bond length in BaTiO3 was increased by 0.72% after biofield treatment as compared to control. Therefore, these findings indicate that biofield treatment may be acting at atomic level of BaTiO3 to cause these modifications. Furthermore, the variation observed in width and height of ESR spectra, which suggest that particle size of treated BaTiO3 might be altered through high energy milling process. Hence, it is hypothesized that biofield treatment has induced the electric and magnetic field that can affect the BaTiO3 powder at electronic and atomic level. To conclude, the biofield treatment could be applied to alter the crystal structure and piezoelectricity of BaTiO3 powder. 1. Aksel E, Jones JL (2010) Advances in lead-free piezoelectric materials for sensors and actuators. Sensors 10: 1935-1954. 2. García-Hernández M, García-Murillo A, Carrillo-Romo FDJ, Jaramillo-Vigueras D, Chadeyron G (2009) Eu-doped BaTiO3 powder and film from sol-gel process with polyvinylpyrrolidone additive. Int J Mol Sci 10: 4088-4101. 3. Hao S, Fu D, Li J, Wang W, Shen B (2011) Preparation and characterization of Ag-Doped BaTiO3 conductive powder. Int J Inorg Chem 2011: 1-4. 4. 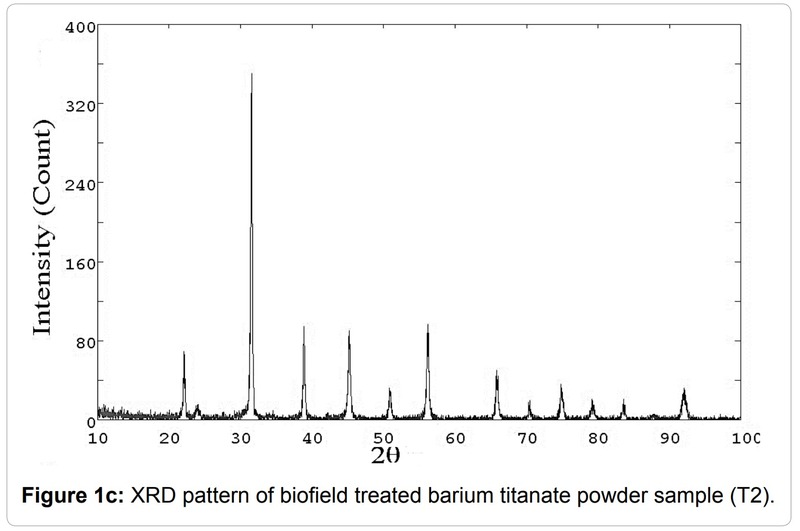 Bhuiyan MRA, Alam MM, Momin MA, Uddin MJ, Islam M (2012) Synthesis and characterization of barium titanate (BaTiO3) nanoparticle. Int J Mater and Mech Eng 1: 21-24. 5. Vijatovića MM, Stojanovića BD, Bobića JD, Ramoskab T, Bowenc P (2010) Properties of lanthanum doped BaTiO3 produced from nanopowders. Ceram Int 36(6): 1817-1824. 6. Slipenyuk AM, Glinchuk MD, Bykov IP, Yurchenko LP, Mikheev VA et al. (2003) Study of BaTiO3 ceramics doped with Mn and Ce or Nb and Sr. Condens Matter Phys 6: 237-244. 7. Pradhan S, Roy GS (2013) Study the crystal structure and phase transition of BaTiO3– A pervoskite. Researcher 5: 63-67. 8. Chernova E, Pacherova O, Chvostova D, Dejneka A, Kocourek T et al. (2015) Strain-controlled optical absorption in epitaxial ferroelectric BaTiO3 films. Appl Phys Lett 106: 192903. 9. Tiller WA (1997) Science and human transformation: subtle energies, intentionality and consciousness (1stedn). Pavior Publishing, Walnut Creek, California. 10. Popp FA, Li K, Gu Q (1992). Recent advances in biophoton research and its application. World Scientific Publishing Co. Pvt. Ltd.
11. Popp FA, Quao G, Ke-Hsuen L (1994) Biophoton emission: experimental background and theoretical approaches. Mod Phys Lett B 8: 21-22. 12. Popp FA, Chang JJ, Herzog A, Yan Z, Yan Y (2002) Evidence of non-classical (squeezed) light in biological systems. Phys Lett 293: 98-102. 13. Cohen S, Popp FA (2003) Biophoton emission of the human body. Indian J ExpBiol 41: 440-445. 15. Trivedi MK, Tallapragada RM (2009) Effect of super consciousness external energy on atomic, crystalline and powder characteristics of carbon allotrope powders. Mater Res Innov 13: 473-480. 16. Dhabade VV, Tallapragada RM, Trivedi MK (2009) Effect of external energy on atomic, crystalline and powder characteristics of antimony and bismuth powders. Bull Mater Sci 32: 471-479. 17. 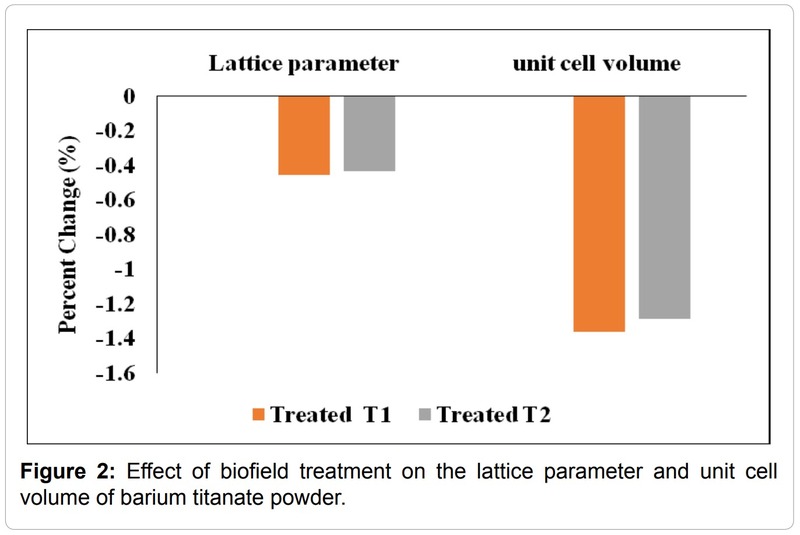 Trivedi MK, Patil S, Tallapragada RM (2012) Thought Intervention through bio field changing metal powder characteristics experiments on powder characteristics at a PM plant. Future Control and Automation LNEE 173: 247-252. 19. Trivedi MK, Patil S, Tallapragada RM (2013) Effect of biofield treatment on the physical and thermal characteristics of Vanadium Pentoxide powder. J Material Sci Eng S11: 001. 21. Trivedi MK, Patil S, Tallapragada RM (2015) Effect of biofield treatment on the physical and thermal characteristics of aluminium powders. Ind Eng Manage 4: 151. 22. Shinde V, Sances F, Patil S, Spence A (2012) Impact of biofield treatment on growth and yield of lettuce and tomato. Aust J Basic Appl Sci 6: 100-105. 24. Sances F, Flora E, Patil S, Spence A, Shinde V (2013) Impact of biofield treatment on ginseng and organic blueberry yield. Agrivita J Agric Sci 35. 25. Trivedi MK, Patil S, Bhardwaj Y (2008) Impact of an external energy on Staphylococcus epidermis [ATCC –13518] in relation to antibiotic susceptibility and biochemical reactions – An experimental study. J Accord Integr Med 4: 230-235. 26. Trivedi MK, Patil S (2008) Impact of an external energy on Yersinia enterocolitica [ATCC –23715] in relation to antibiotic susceptibility and biochemical reactions: An experimental study. Internet J Alternat Med 6. 27. Trivedi MK, Patil S, Bhardwaj Y (2009) Impact of an external energy on Enterococcus faecalis [ATCC – 51299] in relation to antibiotic susceptibility and biochemical reactions – An experimental study. J Accord Integr Med 5: 119-130. 28. Patil S, Nayak GB, Barve SS, Tembe RP, Khan RR (2012) Impact of biofield treatment on growth and anatomical characteristics of Pogostemoncablin (Benth.). Biotechnology 11: 154-162. 29. 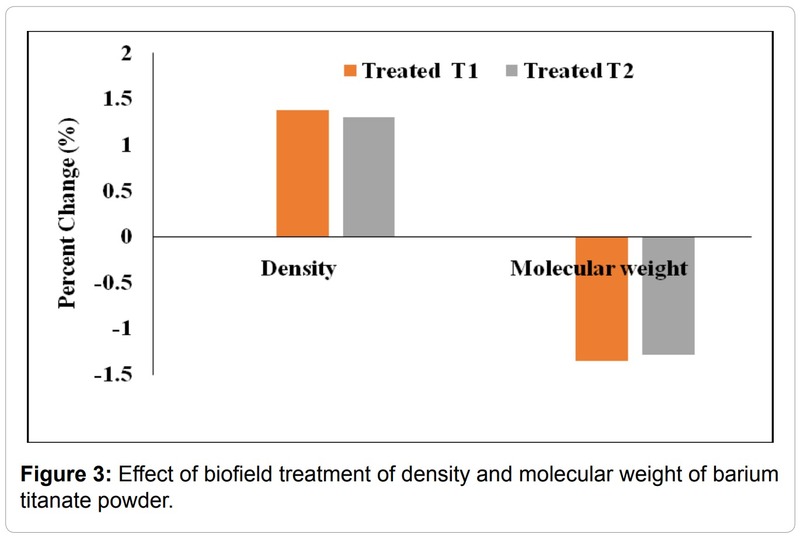 Altekar N, Nayak G (2015) Effect of biofield treatment on plant growth and adaptation. J Environ Health Sci 1: 1-9. 30. 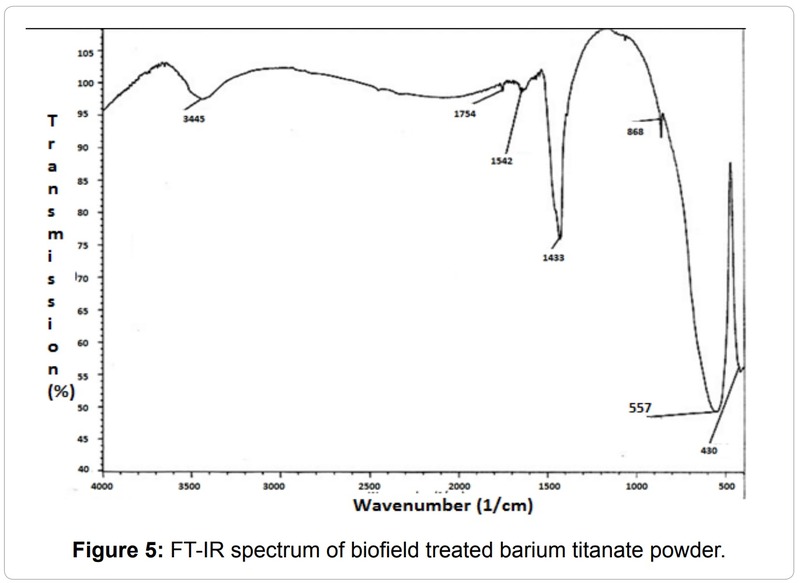 Ertug B (2013) The Overview of the electrical properties of barium titanate. Am J Eng Res 2: 1-7. 31. Tanaka Y, Harigai T, Adachi H, Sakamoto N, Wakiya N, et al. (2013) Strain-driven control of piezoelectricity in (Na,Bi)TiO3-BaTiO3 epitaxial thin films. Appl Phys Lett 102: 1-5. 32. Tanna AR, Vala K, Kushal T, Baraliya JD, Joshi HH, (2012) Synthesis of nano-structured ferroelectric tetragonal BaTiO3. J Sci. 33. Ghosh M, Dilawar N, Bandyopadhyay AK, Raychaudhuri AK (2009) Phonon dynamics of Zn (Mg,Cd)O alloy nanostructures and their phase segregation. J ApplPhys 106: 1-6. 34. EL-Mallawany RA (1989) Theoretical and experimental IR spectra of binary rare earth tellurite glasses. Infrared Phys 29: 781-785. 35. Sun D, Jin X, Liu H, Zhu J, Zhu Y et al. 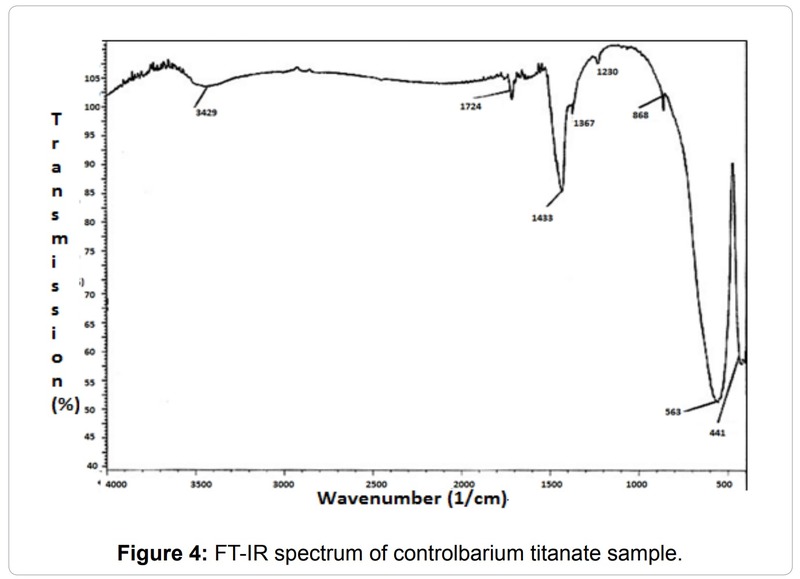 (2007) Investigation on FTIR Spectrum of Barium Titanate Ceramics Doped with Alkali Ions. Ferroelectrics 355: 145-148. 36. Kolodiazhnyi T, PetricA (2003) Analysis of point defects in polycrystalline BaTiO3 by electron paramagnetic resonance. J Phys Chem Solids 64: 953-960. 37. Bykov IP, Slipenyuk AM, Glinchuk MD, Morozovskaya AN, Ragulya AV (2011) Investigation of line shape of esr spectra in BaTiO3 nanopowders. Pennsylvania State University, USA.